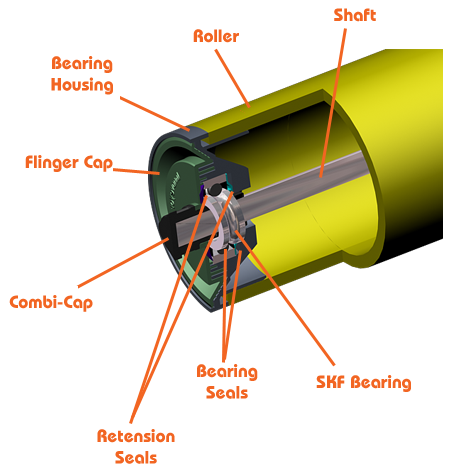 Each shaft end is covered by a Combi-cap shaft cap protector. the SKF PEER Bearing,The SKF/Peer Metric ball bearings sit on top of the Combi-Cap shaft protector and not directly on the metal shaft. The Innoveyor InnoFlex® Self-aligning bearing housing technology; is engineered with 4 independent seal zones which protect the bearing from the ingress of solids and liquids. The centrifugal and mechanical forces created when the labyrinth seals turn, keeps solids out. Idler rolls manufactured with the InnoFlex® bearing housings do not expose steel edges that could tear or damage conveyor belting.